Did you know the United States Speedskating team has won 75 Olympic medals, making it the most successful U.S. winter Olympics sport? But the global economic bear doesn’t take medal count into consideration, and last year the speedskating team was without a title sponsor when Dutch bank DSB went bankrupt. (Why a U.S. bank didn’t sponsor the U.S. team is a mystery to me). Into the breech stepped comedian Stephen Colbert, whose Colbert Nation is now sponsoring the team (in a wacky case of real people sponsoring real people through the conduit of a fictional character). However, the sponsorship only runs through February’s Vancouver Olympics, after which the team will be sponsorless once more. Gold level sponsorship is $300,000 a year for four years, which seems like a pittance in the sponsorship industry? I’ve written before about the potential of using Facebook as your social media home base, and in this instance U.S. Speedskating is doing exactly that. Facebook is more interactive and easier to update than the U.S. Speedskating Web site, and with 3-4 posts per day, and many of them photos or videos, the team is keeping fans engaged on Facebook. Wisely, they are trying to tie into the Colbert program as much as possible, without shifting the focus away from the athletes. Their recent Facebook program of having fans send in photos of themselves wearing their Colbert Nation caps is an example of this integrated approach. You’d like to see more fans of the page (~1,200 as I write this), but I suspect interest will pick up as the Olympics near, and the program matures (the entire social media effort is fewer than 30 days old). They are also posting on related Facebook pages, especially those devoted to broader Olympics coverage, to make sure speedskating fans know the new team page is out there. This is good tactic that is often overlooked. As long as you don’t get spammy, posting on other Facebook pages about your page is perfectly legitimate. Just remember to keep it relevant. If it feels to you like it might be a little over the line, it IS. I also like the way the team is highlighting bloggers. Using a custom Facebook tab called “Featured Bloggers” they are promoting blogs devoted to skating that have covered the team (as well as Colbert’s blog). It’s a good example of using their social graph to boost the social graph of bloggers that cover them. Smart. While Facebook is the core, the team is also interacting with fans (and potential fans) in the wild, with a social media listening program that used an Olympics ticket giveaway as a rationale for interacting. (if you donated to the team, you were entered to win tickets). Agency personnel are also commenting on blogs, providing contextually appropriate links to the Facebook home base. Note that Flint Group is not pretending to BE U.S. Speedskating, but appropriately says in the blog comment that they are helping with social media. A best practice. As you might expect, there are some intriguing stories surrounding the team, including Simon Cho who came to the U.S. as an undocumented immigrant from Korea; Allison Baver, who shattered her leg in an accident last year; and of course Apolo Ohno, the most well-known U.S. speedskater, and Dancing with the Stars alum. Most of these stories are being told via video, with a YouTube channel that’s cross-posted to Facebook. The team is trying to find the budget to send members of the Flint Group to Vancouver to live-blog and video blog the speedskating events, as well as produce live Facebook and Twitter updates. The two biggest challenges seem to be not getting overwhelmed by Stephen Colbert, and operating a social media program where you have very little ability to manage the participants. Corporate marketers, does this sound familiar? 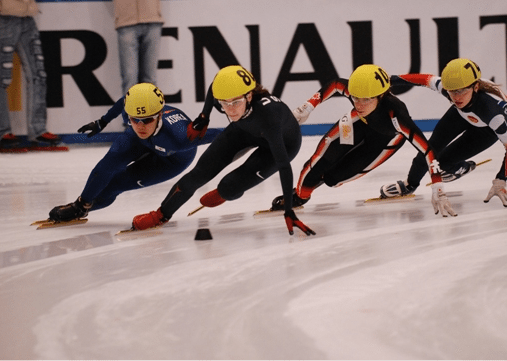 As with many companies where team members have their own personal brands, the U.S. Speedskating team has to work to integrate multiple outposts under an umbrella, while consistently making the case that supporting the team’s unified social efforts is as valuable as individual initiatives. The agency has built and distributed content creation guidelines to the skaters to help consistency. So far, so good. While this integrated social media program doesn’t have a ton of eyeballs on it yet, I think they’re executing wisely.